On Thursday, June 1st the BFS 8th graders gathered for a collection in the Pearl Street Meetinghouse to share and reflect upon their service learning experiences throughout this school year. Their thoughtful and engaging work brings an awareness of HIV and AIDS, and the profound effects this disease has on people throughout the world. One of these experiences was the TOUCH Dinner. TOUCH is an independent, 501(c)3 not-for-profit corporation founded in 1985. Their mission is to serve a weekly dinner to people living with HIV/AIDS. Each Monday evening at 6:00pm, approximately 15-25 people gather at the Brooklyn Meetinghouse at 110 Schermerhorn Street for a free, nutritious gourmet dinner prepared by a group of enthusiastic volunteers. 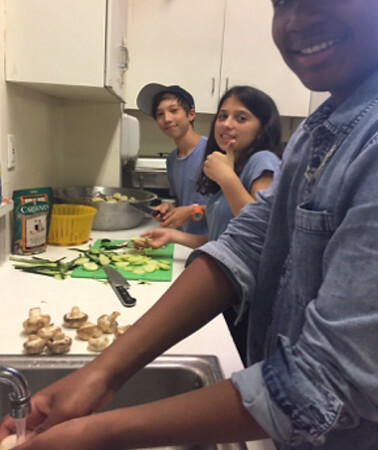 Volunteering at this dinner has been a long-standing tradition for the 8th grade, and students enjoy the process of preparing, serving, cleaning up, and sharing the meal with the guests. Other students engaged in research, learning important facts about HIV/AIDS transmission worldwide, then organizing a presentation for World AIDS Day that they shared with their classmates. 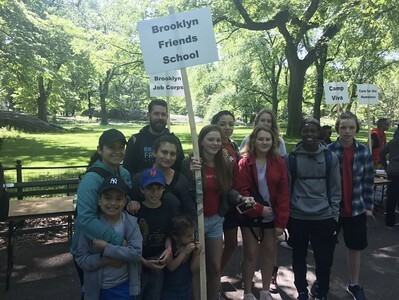 Still others raised awareness by joining the AIDS Walk in NYC on May 21st, while raising money to fund research, treatment, and advocacy programs. This year ten 8th grade students also embarked on a unique opportunity to learn more and help raise awareness about the reality of living with HIV/AIDS. This group chose to participate in a pilot program to connect the knowledge they had gained with a new direct service learning experience as 8th Grade Oral Historians. 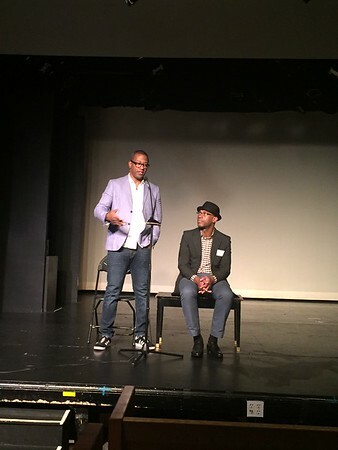 This project involved being trained as oral historians, conducting oral history interviews with people living with HIV, bearing witness to firsthand accounts of their experiences, and then amplifying their voices in our community. From preparing themselves for the interview to considering what they wanted to do with the information, the students carefully and thoughtfully planned out the process. To learn the skill of ethically and responsibly conducting an interview, they attended a training given by the Brooklyn Historical Society. Students reached out to TOUCH Dinner participants offering to share their stories to help raise awareness, and four adults living with HIV in New York City agreed to be interviewed. The students also had to think about what to ask in the interviews. They came up with 20 queries that would encourage their narrators to speak candidly about their lives and how they have been impacted by living with HIV. Answering questions like “What was your life like after you found out you had HIV?” and “How have your relationships changed since you got HIV?” they started deep and meaningful narratives with the students, giving them a real insight into how this disease impacts the person’s world who is affected by it. Two of the oral history narratives were incorporated into the 7th and 8th grade dance classes after the interviews were completed in April. 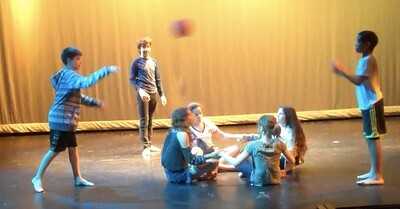 Students were inspired by the words of Larry and Lubin, and created dance pieces that integrated their life stories. With permission, the dancers integrated the actual voices of the narrators from parts of their interviews into the dances as well. The collection on Thursday, June 1st included all of the 8th graders along with three of our oral history narrators and featured the 7th and 8th grade dance performances, a presentation by the 8th grade oral historians, a Q&A with our narrators, and group reflection. Students shared clips from the interviews that highlighted how the narrators’ families and friends received the news of their HIV positive status, moving from feeling depressed and isolated to engaging in HIV/AIDS activism efforts, the benefits of medical treatment in New York City, how the HIV/AIDS epidemic exists because of flaws in our social structure, and the importance of destigmatizing HIV/AIDS and reminding others that those living with HIV are still normal people. The collection was beautiful – powerful, moving, and inspiring for all involved. What did you learn about the impact of HIV/AIDS on the community? How did you feel before, during, and after this experience? What did you do that was beneficial to the community? How do you know? Click the links below to listen to the full oral history interviews that were conducted by our 8th graders with Larry, Lubin, Manny and Malina.